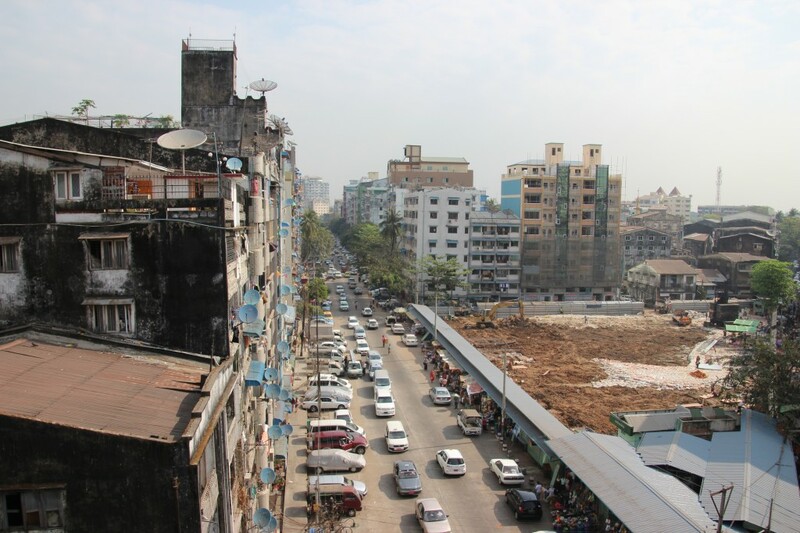 We were more than a little knackered when we arrived back in Yangon / Rangoon at around 6am in the morning, after a rather sleepless night on the bus. However, it was to be our last day in the city so after a couple of hour’s shut eye we headed back out again in to the city, determined to make the most of it. 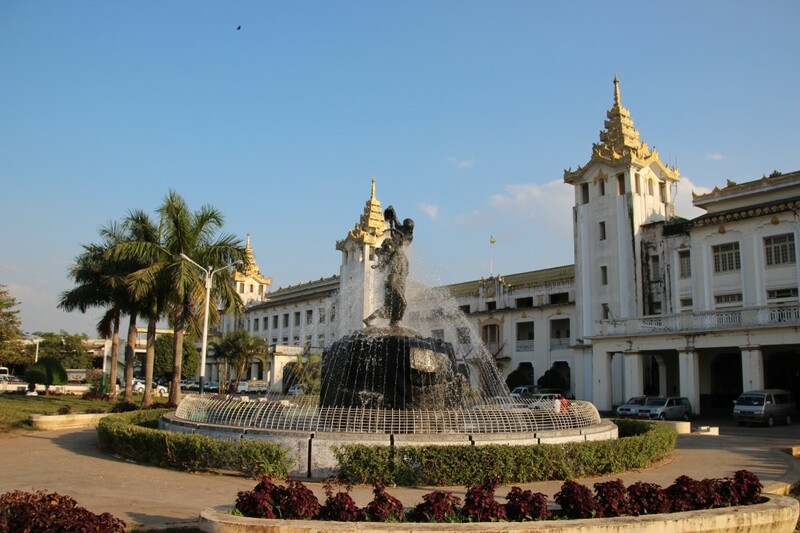 Unfortunately, between 10 am and 4pm, the temperature in Burma means that when ‘making the most of it’ you should expect to be stupidly uncomfortably hot, especially when nipping around a city on foot. Still, we managed to get quite a bit done and I didn’t even get grumpy (Nick is getting good at proactively preventing this with well-timed suggestions of food and sit-downs). 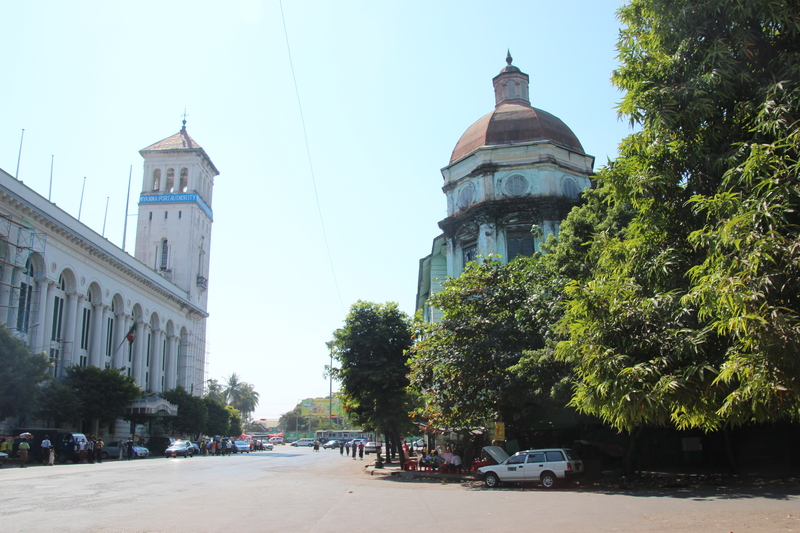 First on our list was Pansodean Road, a rather beautiful street in Yangon full of crumbling grandeur and old colonial buildings, one of which is the former Grindlay’s Bank building where my Grandpa used to work. Next door to this building are the offices of the Yangon Heritage Trust, in which there was a small but interesting photo exhibition on old Rangoon. 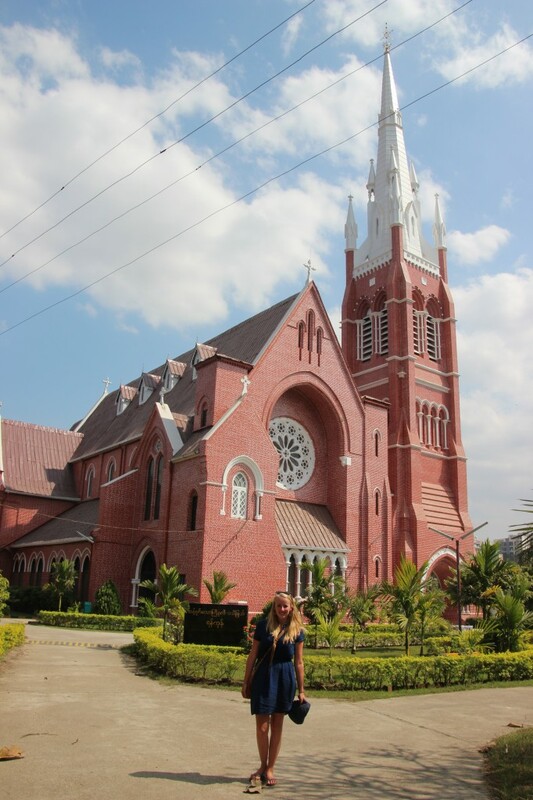 After a rather porky and rich lunch at a Chinese restaurant by the docks, we continued our tour of Yangon down the busy Bogyoke Aung San Road, home to loads of interesting things including Holy Trinity Cathedral where my Dad was christened. 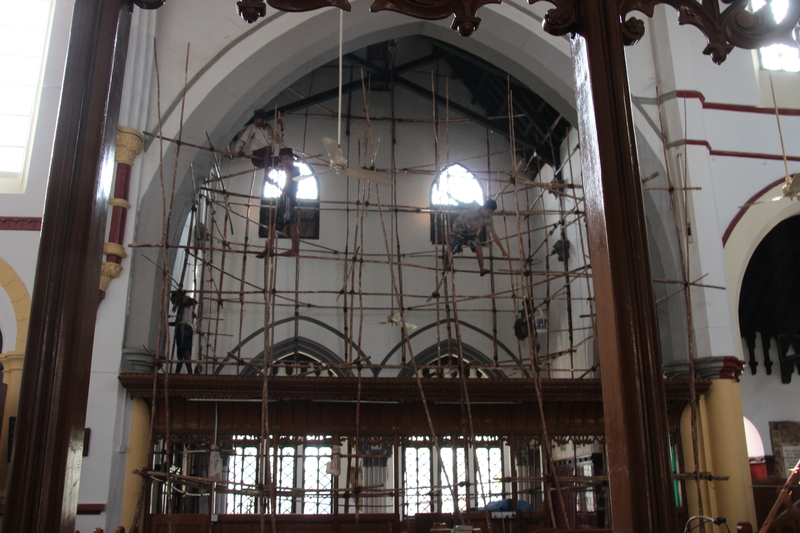 It turned out that the cathedral is currently undergoing renovation work (which included webs of bamboo scaffolding from which workmen hung) but we crept in anyway and took a look around. Once again, it was surreally lovely to be in the same space that my family would have occupied so many years before, and it was also really interesting to wander around the cathedral and look at all the plaques commemorating the Gurkha regiments that fought in World War II (we think Grandpa was in the 14th Army – the Gurkha regiment and the Sikh Rifles). The sprawling Bogyoke Aung Market was just down the road from the cathedral so we had another wander around there, taking in the various gold and silver sellers, as well as the cheaper T-shirt stalls. Try as we did we were mightily disappointed that a Yangon United shirt cannot be bought in Yangon for love nor money. 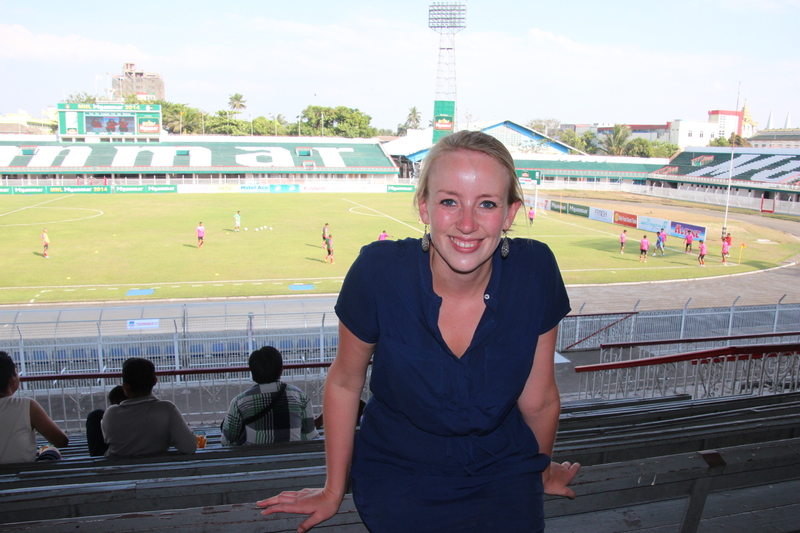 Our hunt for one even took us to the Yangon United football stadium, opposite the train station (another lovely old building). Although we couldn’t find any shirts, we did find there was a match on so we bought tickets for a quid each and settled down on the wooden benches in the only occupied stand. Watching Zwekapin United FC Vs Yadanarbon FC was a great way to spend a hot late afternoon – it could only have been made better if we could have bought a nice cold beer in the stadium. We were surrounded by not all that many other people, but those who were there were pretty vocal in their support and almost as noisy in their nut cracking and shelling (surely a much healthier snack than a half-time pie?). With an early lead by the red team (I’ve forgotton which was which) the first 30 mins were pretty good to watch, and then our excitement waned with the players’ energy, as the heat of the day seemed to get to them. By half time they were dead on their feet and unfortunately so were we; in order to make our evening plans we had to admit defeat and leave early. And what a fantastic evening it was. 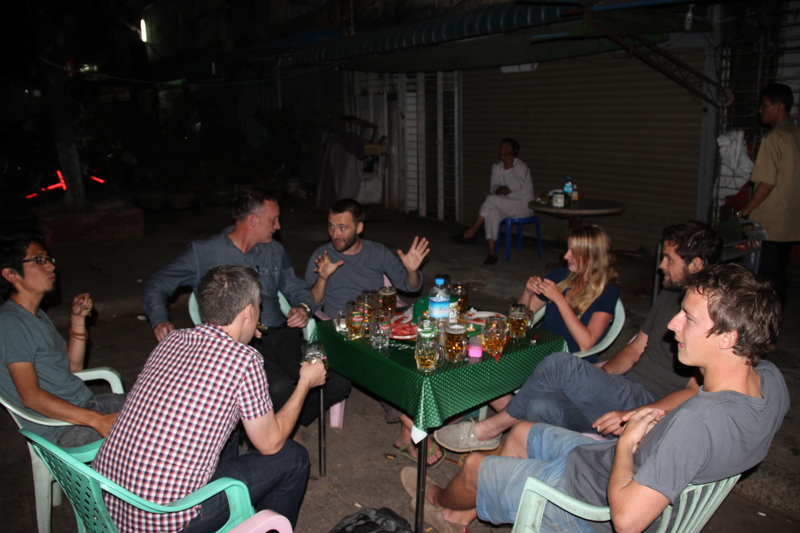 We met up with the lovely Tony – an old school friend of Nick’s – who is living and working out in Yangon and has some very interesting stories to tell about his time there (as well as knowing a very nice place to eat steak). After an awesome dinner in Golden Valley (said steak) we headed over to a beer station where we would while away a good number of hours in the good company of Tony and his friends and colleagues. 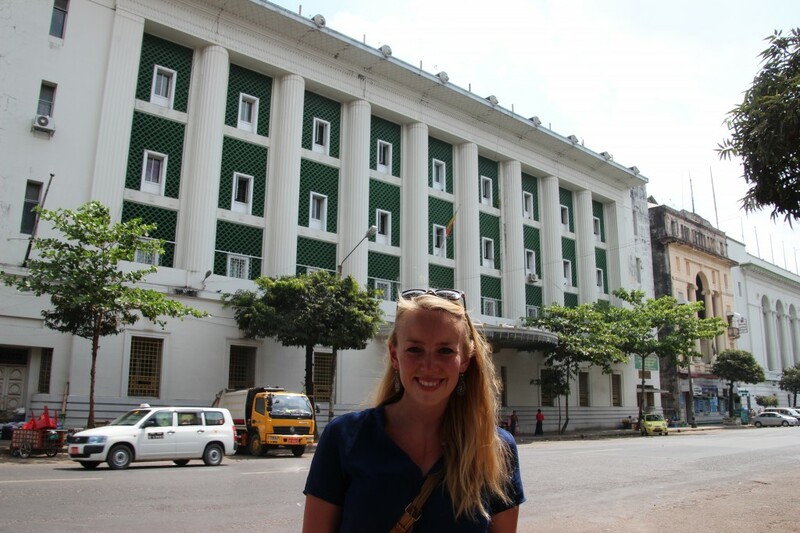 Our last stint in Yangon / Rangoon had been a great way to end our trip to Burma. Since August we have invariably found it tough to tear ourselves away from the amazing places we’ve visited; but this departure felt a lot harder than usual. This was, I suppose, down to a combination of emotional ties and the knowledge that even if we are lucky enough to one day return to this country, it will have undoubtedly changed to some unknowable extent. We feel ever so privileged for the things we experienced during our stay, and we realise that they are experiences that will be near impossible to repeat. For that reason we were unbelievably happy to have visited Burma, and so very, incredibly, sad to leave. NEXT TIME: How bizarre is Bangkok?! BREAKING BAD UPDATE: Series 4, episode 3.